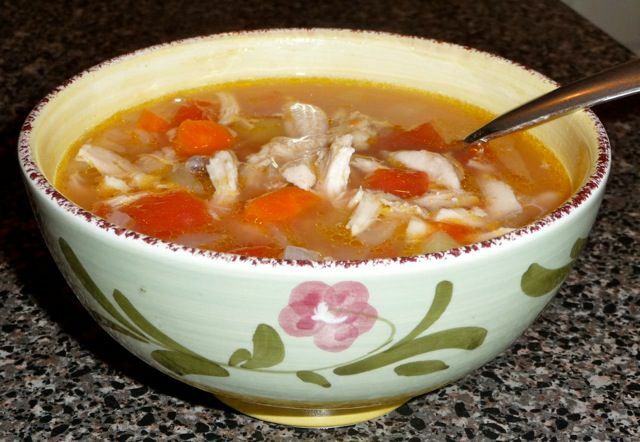 The most recognizable chicken soup in Greece is Avgolemono (ahv-goh-LEH-moh-no) or Egg-Lemon soup. With Avgolemono, the traditional broth is thickened with eggs and flavored with lemon to make a dense, creamy soup well suited to colder weather. This Greek chicken soup recipe is simpler; it's not quite as heavy, but it still makes a hearty, chunky soup with a rich flavorful broth. 1 whole chicken, 3 1/2 to 4 lbs. Clean the chicken and remove skin and excess fat. Add 8 cups water to a large soup pot and add chicken, celery, onion, salt, and pepper. Bring liquid to a boil and simmer partially covered for approximately 45 minutes. Remove the chicken and set aside to cool. Carefully strain the broth through a fine sieve and reserve. If you choose to de-fat the stock, you can refrigerate it overnight and simply skim the fat off the top before using. Heat the olive oil in the soup pot and add onions, carrots, celery, and potato. Saute the vegetables for 5 to 10 minutes or until tender. Return the broth to the pot, add bay leaf and diced tomatoes and 1/2 cup orzo pasta. Simmer partially covered for at least 45 minutes until vegetables are cooked through. Stir the pot occasionally so that the pasta does not stick to the bottom. While the soup simmers, remove the chicken meat from the carcass. Dice the chicken and return to the pot to be heated. You may need to add a little bit of water or canned chicken broth to supplement the liquid in the pot.